WHY SHOULD YOU PARTNER WITH KPDA? Access to information that will bridge the gap between your company and the rest of KenyaFor more information on the KPDA 2018 Calendar of Events, please email ceo@kpda.or.ke or call 0705 277 787 or 0737 530 290. Event Brochure: Your organization’s name will appear in all brochures (if produced). Newspaper Advertisements: Your organization will get prominent sponsor name recognition in all event press releases if published. Event Program and Announcement: Your organization’s name will be listed in the event’s program and will be recognized as a sponsor. Event Announcement: Your organization will be recognized as a sponsor. 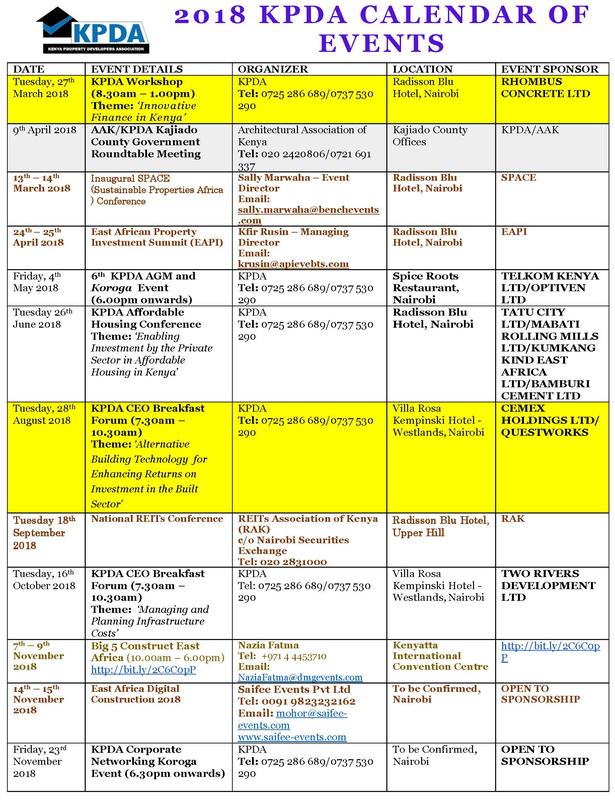 For more information on the KPDA 2018 Calendar of Events, please email ceo@kpda.or.ke or call 0705 277 787 or 0737 530 290.